WHAT A GREAT PERFORMANCE AND A GREAT SET LIST JUST LIKE RELIVING THE YESSONGS DAYS LAST TIME I SAW YES IT WAS THE DRAMA TOUR IN 1980 THIS WAS THE REAL DEAL HIGHLIGHT FOR ME WAS AWAKEN AND RICKS SOLO SPOT ALSO GREAT TO HEAR TO BE OVER DONE BY STEVE PITY IT WAS ONLY 2 HOURS I WISH THEY COULD HAVE PLAYED LONGER ANYWAY SUPERB GREAT TO HEAR SOME REAL MUSIC RELIVED FROM THE 70,S AND LONG LIVE PROG ROCK.. Went to the bands hotel before hand to see if I could get autographs. Managed to get everyone except Steve. The band seemed in a hurry but Rick was so nice and friendly whilst Jon with Janeeeeeeeeee looked tired. He eventually signed when I assured him I wouldnt try to sell it on Ebay. Chris was last (as usual) and didnt look to happy. Got to the stage door just before the band were arriving. Around 20 - 30 people were waiting. Yes got off the bus quickly with Squire doing a very good impersonation of a speeding train heading for the door. Rick followed and said they were running late but signed a few autopraphs and had a laugh. Jon then sped thru with Janeeeeeee - very much like the front cover of his album "the more we know". I clearly asked her to look at the camera for a photo (3 times) but she just ignored me.........fair enough! Great concert tonight. It was a complete sell-out. Started at 8pm. 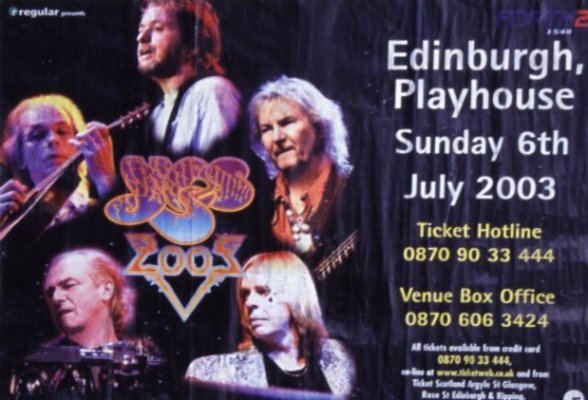 Rick certainly made a difference to the band as this was the best ever Yes performance that I have witnessed. When they burst into Siberian Khatru it sounded superb! When Rick played the harpsichord part just after the initial verses of Khatru he got a great reception........welcome back!!! Good sound balance although Jon did seem a little down in the mix early on but it was hardly noticable. He drank water through-out the performance and sounded just a little crooky during Magnification. SSOTS was awesome. Chris was doing a really cool sort of march/dance during the lesser bass parts of the song. Rick and Steve had a great duel at the end of the song before it came to a worthy climax. Steve's solo spot was very much appreciated by the crowd especially To Be Over. The second half of the show belonged to Chris. He turned it on big time. HOTS was excellent (a song which I could take or leave on past tours). It sounded reborn........probable down the Rick. I don't care what any of you say........Rick Wakeman is the man. Igor, Brislin & Moraz don't even come close! Chris played his Usual solo stuff then gave Rick a few *high fives*. They played Awaken and everyone was on their feet just after the "masters of images - master of time" part of the song until the end. Really felt great. Finished off with Good People and Roundabout and never came back on for a third encore. Jon dance with Janeeee at the side of the stage during the instrumental parts of both encores.......nice to see she had cheered up. The fans chanted we want more but they all eventually went home very happy, no complaints. Chris was first to arrive (isnt he always last???) and was drunk. He was really funny and happily posed with everyone and signed autographs and posed for pictures. It was great to finally meet him. His hands are massive. Someone gave him a copy of that new dvd musikladen thing which has been repackaged to sign and he laughed and didnt recognise it. He spent around 5 mins examining the package and said he'd like to take it away to ask his manager about it. Very funny! Alan came in next about 10 mins after Fish. Again he was really nice and pleasant. I called him Mr Thunder (as heard on amy) and he laughed. Happily signed stuff too and laughed and joked. His mum had came so after he attended to everyone he stayed close to her although he did freely mingle. Steve came in about 15 mins later and looked happy. Didnt like posing but he signed everything. Steve was quiet and didnt stay too long. He slipped out the back way so I missed a photo opportunity with him.